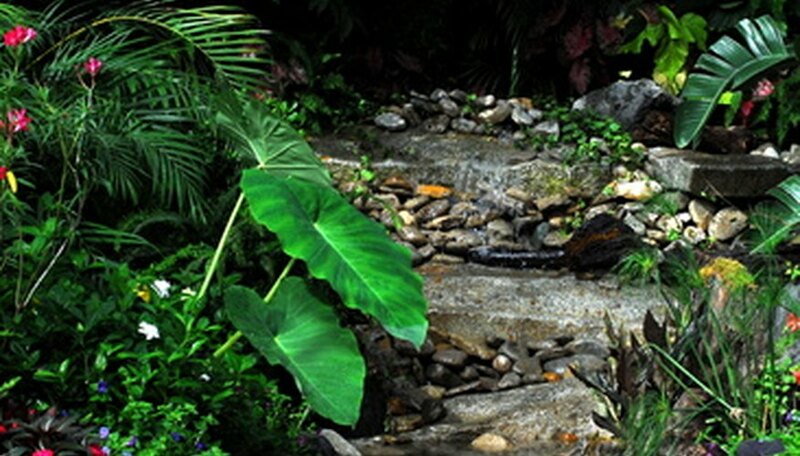 Living in a cold or temperate zone does not preclude having a tropical garden. There are a number of hardy plants that will provide an exotic look and techniques for each of them that will increase winter cold tolerance. A tropical garden will require some specialized skills and a bit of work, but the appearance of a lush jungle during the summer months makes it well worth it. Taro (Colocasia esculenta) has very large, often colorful leaves up to 4 feet long. Despite its origins as a jungle plant, taro will even survive in cold climates. The bulb can be left in the ground over the winter with a heavy covering of mulch in zones 7 through 10, but in colder areas the dormant plants should be dug up and stored over the winter. Taros love nitrogen-rich soil and ample water in the summertime, but winter wetness can kill them. Taro will develop noticeably larger leaves if grown in partial shade, with morning sun being preferable. Growing taro in a pot that can be moved indoors with the onset of cold weather is another option in frigid climates. Japanese fiber banana (Musa basjoo) will reliably survive very low temperatures with some protection. This plant will eventually grow quite large, producing offsets from the roots to form a sizable clump. A rich mulch of composted steer or chicken manure will accelerate growth. Even in very cold areas, musa will reach a height of 10 feet or more. In growing zones 5 and 6, winter protection is necessary. A framework of chicken wire should be placed around the plant after the foliage has died back in fall. This framework can be filled with mulch such as straw or leaves, covered with plastic and then canvas or burlap and tied securely. Remove the covering in spring after frost danger is over. New growth may be pale and spindly from growing in darkness but will rapidly green up with sunshine and warm temperatures. In zones 7 through 11, no protection is needed unless winter weather brings prolonged below-zero temperatures. Yunan banana (Musella lasiocarpa) is a slightly less hardy banana than Musa basjoo, growing best in zones 8 through 10. Zone 7 gardeners can overwinter this plant by protecting it as with the Japanese fiber banana. Musella has longer, narrower foliage than most other banana species and grows 5 to 8 feet tall. The flowers are spectacular and rather strange looking; they have the appearance of very large yellow artichokes. Planting young specimens in early spring will give them enough time to grow and become acclimated for maximum winter hardiness. Windmill palm (Trachycarpus fortunei) is proof that palm trees can be grown just about anywhere. Hardy to 0 F, colder temperatures may cause some death of foliage, which will regrow in spring. Older, longer-established plants display better cold tolerance. This palm is slow-growing, to 10 or 15 feet in most areas. Windmill palm needs rich soil and should have a light surface dressing of agricultural lime every spring. Young plants and those grown in marginal areas benefit from some winter protection. This can take the form of a vented miniature greenhouse or a simple frost blanket applied during cold snaps. After a particularly bad winter, check the topmost fans of the palm. Even if they appear dead, a light tug will ascertain if they are rotted at the crown. If that is the case, a spray of copper fungicide will often stop further rot and save the plant. New growth should emerge in late spring from the central rosette. What began as a lifelong gardening fixation turned into a career for Jean Lien. She has more than 15 years of experience in the nursery industry and landscaping, and three years of horticulture at South Puget Sound Community College. Lien began writing in 2009 for various websites.